​John Bartels has been on the Carlin Nalley Foundation Board of Directors since 2009, and has served as President since 2013. John is a 1985 graduate of Lisle High School, and a 1989 graduate of the University of Illinois in Champaign-Urbana with a degree in Chemical Engineering, and has worked as an engineer and manager at BP for the last 26 years. He lives in Lincoln Park with his wife and two daughters. Jay Grochowski (Class of 1977) is a founding member of the Carlin Nalley Foundation and served as its President before stepping down after his second term and moving to a Director position. Jay is in sales with Sharp Electronics Corporation of America and is a graduate of Indiana University. He and his wife Rhonda have two children, Lauren and Stefan. Quote: The Carlin Nalley Foundation celebrates the graduating seniors who honor our school, community, and alumni with their achievements, citizenship, and dedication. Our Foundation and each scholarship, is named after a faculty member or alumnus who embodied these values. We are proud honor the students and faculty, past, present, and future, who make our high school a special place. 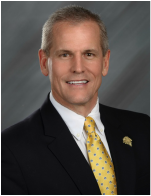 Alan Nalley (Class of 1986) has served as Treasurer for the Carlin Nalley Foundation since 2008. Alan graduated from NIU and passed the CPA exam in 1991. He also has an MBA from the University of Chicago. Alan works as a Finance Manager at BP in Chicago, Illinois, and lives with his wife (Denise) and daughter (Katie) in Plainfield. Quote: "I believe the unique experience of growing up in Lisle has formed a strong connection across alumni. I am proud to be a part of this community and generate support for current outstanding LSHS graduates." ​​Robert Taylor ('89) has been on the Foundation since 2008, serving as a Director and now as Secretary. He is a Benedictine graduate and has Master's Degrees in Developmental Psychology from ISU and Curriculum from North Central, as well as a CAS in Nonprofit Leadership from Northwestern. Robert is a National Board Certified Teacher and Golden Apple Fellow teaching in the Palatine School District. He and his wife Marcy live in Lisle with their son Jack. "The Carlin Nalley Foundation is a reflection of the culture of our town, notably our strong family and educational values. There are no other alumni based foundations in our area giving anything like our diverse scholarship offerings, and that speaks volumes." Bill Buchelt (Class of 1984) has been serving as director on the foundation since 2012. He is a graduate of Illinois Benedictine University (Class of 1988) with a degree in marketing and economics. Since 1988, he has owned and operated Elan Photography in Lisle. He presently lives in Lisle with his wife, Nicole and their four children; Mackenzie, a senior at Valparaiso University, Benjamin, a sophomore at Illinois State University, and Alison a senior and Jordan, a freshman at Lisle High School. "I am very proud and honored to be a member of the foundation named after a man who is very influential in my life when I was growing up, Coach Nalley. In a cause that I absolutely believe in, this foundation serves to support the graduates of Lisle Senior High School in their continuing education endeavors." ​Don Krause (class of 1972) was voted on to the Foundation board in 2015. He is a ’74 grad of the College of DuPage and has owned his own advertising firm since 1988. He is also a business broker firm under the Midwest Group umbrella. Don donates his time & talents to the Bronzeville Dream Center in Chicago. He lives with his wife Kathy in Lisle and has 2 children Katelyn & Donny. I am from the Class of 1980 at LSHS. I then graduated from North Central College in 1984 with a BA, and the John Marshall Law School in 1987 with a Juris Doctor Degree. I became licensed to practice law in the State of Illinois immediately thereafter. I worked for a larger firm, then a smaller boutique, firm both in Chicago, until I opened my own practice in 1998 in Naperville, where I have remained. I primarily handle real estate, estate planning and administration along with PI litigation. "I believe that Coach Nalley contributed a great deal to Lisle High School, and the greater community as an administrator. I was proud to be asked to me a member of an organization that continues in the same path set forth by the Coach, and for years to come. "